As before, originals and transfers are by the great courtesy of Mr. Raymond Glaspole, with further denoising in The Cave; and the label scan has kindly been made available by Mr. Julian Futter. This first record includes the Paganini Caprice (with piano) mentioned by Tully in his article in The Strad but overlooked in my first post. The next two records make up an almost complete recording of a lovely Trio Sonata by Pugnani (there was clearly no room for the third movement Minuet) - hardly common fare today, let alone in 1924! And I'm pleased to have identified the delicious Boccherini excerpt, with the aid of Yves Gérard’s invaluable thematic catalogue. Never heard of Norman Fraser? Nor had I. There’s a useful section on him in this article by Philip Scowcroft. The Cueca is a Latin American dance and the national dance of Chile, where Fraser was born. I believe he rewrote what had originally been a solo with piano as a duet, specially for the sisters. 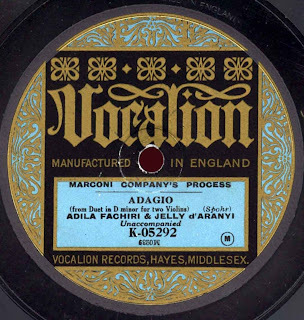 This is the sole electrical record in their Vocalion discography - see the label above, crediting the Marconi Company’s Process, which Vocalion started using in August 1926. The Fraser sounds rather plummy here, though, so below you'll find a link to a version re-EQd by a friend. Download the above as 12 mono FLACs, fully tagged, in a .rar file, from here. 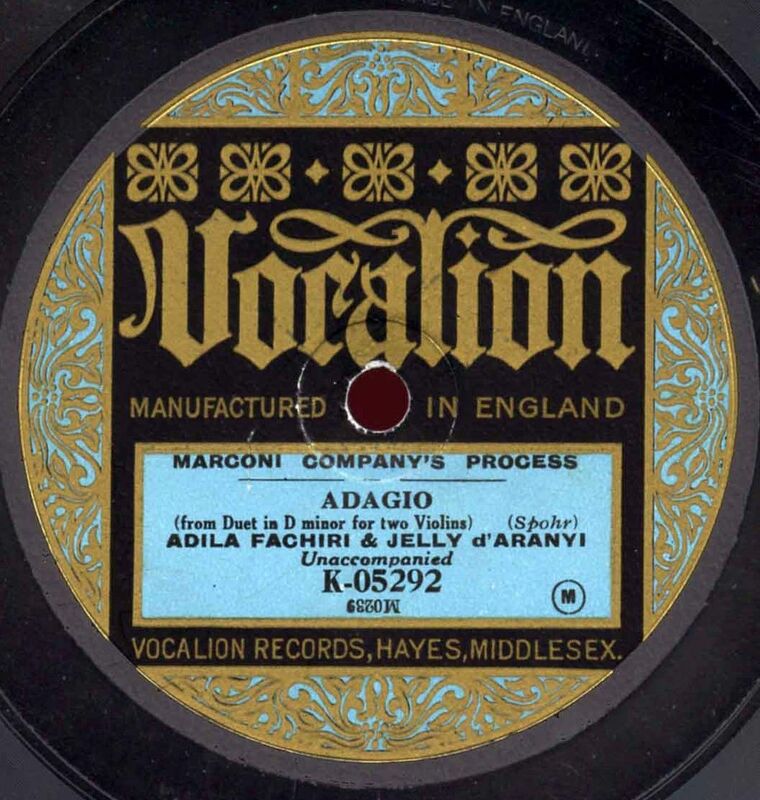 Download a re-EQd version of Vocalion K 05292 here. There’s more ‘roar’ from the surface but the sound is more plausible, I think. The Fraser was short on higher frequencies to start with, I fear. These have been in the cave so long they have Spohrs growing on them! Seriously, chap (I like to use these kinds of words when talking to brits, I hope it doesn't make you feel awkward) I really must sit down and explore all this. Unknown repertoire to me! Sincere thanks to you and your kind benefactors! I've listened to the first 2 tracks so far...WOW! That Paganini number, such wild, frenzied playing there, it's just so very unseemly for a WOMAN! (snicker) Jelly d’Arányi was definately a lady ahead of her time! Greetings from the USA!